Send mail to the web master with questions or comments about this web site or the unit. Do you want to join us in defending our state and restoring the Union? Please email Sarge Nash(firstmdus@comcast.net)or email Asst recruiter Pvt Seigel. 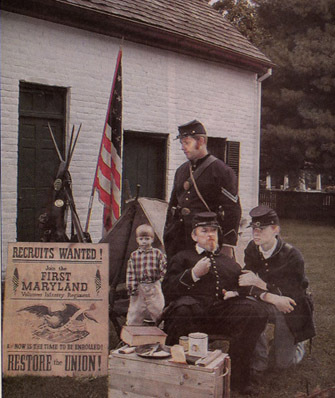 You can also call (410-451-1517) the unit and we will have our Recruiting Officers, contact you with more information on joining the First Maryland and the hobby of Civil War Living History. No one under the age of 16 will be allowed to carry a rifle. However, we can always use muscians and unarmed civilians. All minors must have parental permission to join the unit.